Voices for both ‘In’ and ‘Out’ campaigns in the EU referendum are failing to connect with the undecided voters who will determine the result, and may actually be harming their own cause, according to How (not) to talk about Europe, a new pamphlet by British Future, which explores how and why the referendum remains up for grabs for both sides, examining in detail the undecided voters that both sides will need to reach in order to get over the 50% winning line. The report looks at the key issues of the referendum – including immigration, national identity and the economy – and makes recommendations to advocates on both sides of the debate. The EU referendum will give voters the power to make one of Britain’s biggest political decisions in a generation – yet most people aren’t yet certain which way they will vote. Both ‘In’ and ‘Out’ have a long way to go before they can persuade the undecided voters who will determine the referendum result. At times, both risk turning off the very voters they seeks to attract through the arguments they use and the people who are making them. The successful campaign will be one that moves beyond talking to people who are already onside and surprises voters with an approach that reaches a broader audience. In this wide-open referendum, both sides must realise that they will only win if they’re willing to risk upsetting their core supporters. For ‘In’, that means engaging with voters’ worries about immigration and showing they understand the importance of identity – that this referendum is taking place in Britain, not in Belgium. Purple Rain – A narrow win for ‘Out’ in a low-turnout referendum where only those who care most about the EU show up. Boris Johnson lends a more positive, cosmopolitan feel to the Brexit campaign, while ‘In’ fails to give undecided voters enough reason to turn out on polling day. Britain’s got Euro Fever – David Cameron’s renegotiation is better-received than expected and Conservatives broadly unite behind the PM, leaving the polarising Nigel Farage as them main voice for ‘Leave’ and a clear win for ‘Remain’ in a high-turnout vote. An uncertain and temporary truce – A narrow win for ‘Remain’ in a knife-edge vote. Younger voters, women and ethnic minorities are unmoved by a ‘Leave’ campaign that is perceived as ‘blokeish’ and overly focused on immigration. The Swing Out Sisters – Home SecretaryTheresa May leads a successful campaign to take Britain out of the EU, with UKIP’s Suzanne Evans also playing a prominent role. Undecided women switch to ‘Out’, while the ‘Remain’ campaign’s front bench of Blair, Mandelson and Richard Branson look elite and out of touch by comparison. The result is a clear win for ‘Leave’, with London the only part of Britain where voters prefer to stay in the EU. The authors suggest that there may be more common ground between ‘In’ and ‘Out’ campaigners than many might expect. In seeking the support of more than half the electorate, both sides will have to occupy common ground on which most of us agree: that we have a proud, positive and inclusive national identity and that Britain is part of the global economy, open to the wider world. Modern Britain may have its flaws but most of us think it’s a pretty good place to live. Those who want to take us back to the 1950s will find that most people don’t want to come with them. But others who are dismissive of the identity, history and culture that make us uniquely British, rather than European, will get an equally-cold shoulder from the voting public. 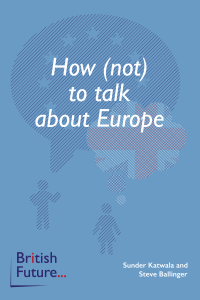 How (not) to talk about Europe calls on all sides to commit to a high-turnout, high-engagement referendum that provides a fair and definitive answer to one of the biggest questions currently facing Britain.